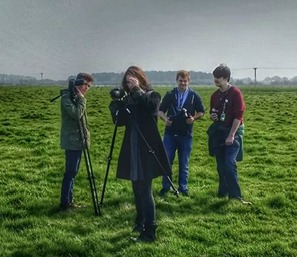 We are really excited to have worked with young film maker Jack Howard. Jack has joined us in support of Heritage Lincolnshire's campaign to Save The Old Kings Head. 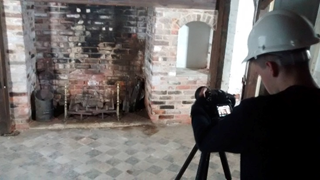 As part of our crowdfunding campaign to save the building, young film maker Jack Howard volunteered to make us a campaign video. We have been amazed by Jack’s professional skills. Having just graduated from Boston College’s film making course Jack impressed us instantly with his ability and enthusiasm. Earlier this year with fellow students from Boston college, Jack helped to produce our Layers of History promotional video. They braved the springtime bad weather to produce a film that shared the positive impact our project had on volunteers. It was fantastic! Therefore, when Jack got in touch to propose doing another project, we snapped him up immediately. In the morning, armed with tripods and cameras Jack shone his bright lights on the Old King’s Head. Ghouls and ghosts hid behind doors and up chimneys while Jack’s powerful LEDs bathed every nook and cranny in white light. Thanks to his camera and filming technology, when launching our crowdfunding campaign, we will be able to share the Old King’s Head in focus that we never have done before. After a morning in Kirton, Jack joined us in Heckington and turned the office upside-down, catching camera-shy employees on film! It was a fun day with lots of new experiences for us and our new friend Jack. Most of all, our enthusiasm for the Old Kings Head will shine through when our crowd funding video is released in September.